6 things you should plan before delivering your first baby! You are excited about your first child and have planned many things for her in advance. After the birth, your whole life would revolve around your baby. And suddenly there would be just baby talk and baby stuff all around you. These are the six MOST IMPORTANT things; you should know or plan before giving birth. 1. Cord/ Stem cell banking - This is a once in a life time opportunity. As you enter your sixth or seventh month of pregnancy, check the best companies and best plans that suit you. Stem cell banking is like a fixed deposit of your babies and family's health. And can assist in curing major life threatening illnesses at any stage of life, for her and your family. Search on the net about this and you would know why it is important to bank them. 8 things you should carry when travelling with infants! You are planning a holiday with your baby for the first time. You have a big list of things, but still sceptical if you are carrying appropriate stuff for her or not. Your heart says pick everything the baby is used to but mind says can we do without it? 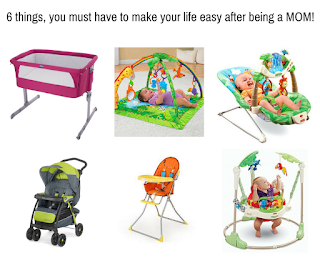 6 things you must have, to make your life easy after being a MOM!